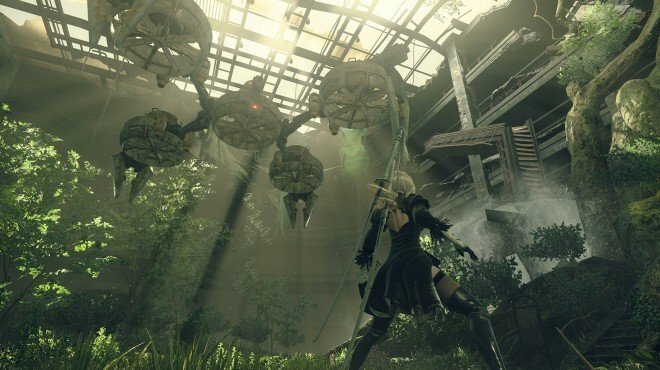 The Machine Surge is a Main Story Quest in NieR: Automata. Go to the Desert Zone, located near the City Ruins: Center Access Point. Return to the Resistance Camp for your reward. Must have completed The Supply Trader's Request and The Weapons Dealer's Request in order to be given this quest. If you talk to the Supply Trader in the Desert Zone on your way back to the Resistance Camp, he will give you 3 Small Recovery and 1000 G.
I went right straight away and found the robot who runs early on, effectively skipping like 90% of the quest. A bit disappointing. This quest seems to have a game breaking bug (PC). When you get back to Resistance Camp to return quest, as you cross a check point with 2 Resistance members, you trigger a dialogue. After finishing the quest and got the next one, I crossed that point again to go back to the desert. Then when I tried go back to the Camp, the dialogue triggered again at that same spot, only this time there&apos;s no dialogue, only 2B walking slowly and with black bars at top and bottom, like when she does get a dialogue. When I saved game after that, the save seems to be corrupted and cannot be loaded (stuck at loading screen).